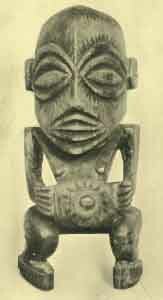 Wooden figure of Tangaroa Upao Vahu, a sea-deity, represented in the act of creating other gods and men. From a temple in Rurutu Island, Austral Group. British Museum. The Genealogical or Evolutionary Type.--Omitting for the moment such variations as exist between the versions current in the different islands, the essential elements of this form of the myth may be stated as follows. In the beginning there was nothing but Po, a void or chaos, without light, heat, or sound, without form or motion. Gradually vague stirrings began within the darkness, moanings and whisperings arose, and then at first, faint as early dawn, the light appeared and grew until full day had come. Heat and moisture next developed, and from the interaction of these elements came substance and form, ever becoming more and more concrete, until the solid earth and overarching sky took shape and were personified as Heaven Father and Earth Mother. At this point, as a rule, the evolutionary sequence stops and all further things, both natural phenomena and all the myriad gods, are the offspring of bright Heaven by Earth or some other female principle. In Whai-tua two existences without shape were formed: Maku ("Moisture"), a male; and Mahora-nui-a-rangi ("Great Expanse of Heaven"), a female; and from these sprang Rangi-potiki ("The Heavens"), who took to wife Papa ("Earth") and begat the gods. The sequence here, leading from the original undifferentiated void through -various stages of darkness and light to space, in which the parents of the bright sky took form, illustrates at once the dual character of this type of myth; for here we find both the idea of progressive development and the individualization of the successive stages in this evolution as a genealogic series. Apparently it has been generally assumed that this evolutionary, genealogical myth was entirely typical of Maori mythology; but in reality the matter is far from being so simple, for the New Zealand beliefs appear to be somewhat confused on the subject of the origin of Rangi and Papa. The version just outlined ascribes to Rangi a long ancestry and development, but other legends 7 allude to a primeval sea, out of which the earth (Papa) grew, later to be taken to wife by Rangi, the Sky Father. Other myths, 8 again, omit all reference to an original chaos, and without attempting to account for Rangi and Papa simply assume their existence, and then go on in much detail to describe the birth of Rangi's various progeny by a series of wives, who are usually given as six. 9 By the first, Poko-ha-rua-te-po ("Pit of the Breath of Night"), he had as offspring Ha-nui-o-rangi ("Great Breath of Heaven"), Ta-whiri-ma-tea ("Beckoned and Desired"), and a whole series of winds, as well as rites and incantations, all personified. By the second, Papa-tu-a-nuku ("Flat, Resembling the Earth"), he was the parent of Rehua, Tane, Paia, Tu, Rongo, Ru, and a host of other minor deities. Now Papa-tu-a-nuku was the wife of Tangaroa, but had deserted him, coming to Rangi while Tangaroa was away. When the latter returned and learned of his wife's faithlessness, he attacked Rangi and speared him in the thigh; and during the time that the Sky Father was thus wounded, he begat another series of deities. [paragraph continues] Rangi's third wife was Heke-heke-i-papa ("Coming Down to Earth"), by whom he had many children, the most important being Tama-nui-a-rangi ("Great Son of Heaven"). By his fourth wife, Hotu-papa ("Sobbing Earth"), he was the father of a host of children, for the most part of little note, though Tu and Rongo again appear among them. The offspring of the fifth and sixth wives were unimportant. Although Rangi is thus said to have had various wives, a comparison of the different accounts would seem to emphasize the pre-eminent importance in the Maori mind of the Heaven Father and Earth Mother pair; and, indeed, some versions 10 do not seem to recognize any other. This conception, familiar in classical mythology and elsewhere, seems very characteristic of New Zealand, and apparently reached a higher development there than elsewhere in Polynesia. For the Sky Father an origin from the primeval night or chaos is, as we have seen, sometimes asserted; but no explanation of the origin of the Earth Mother is usually thought necessary. New Zealand thus exhibits, a type of cosmogony in which the evolutional element, although sometimes well marked, is not invariably present; and in which the belief in the Sky Father and the Earth Mother seems especially strong. The general character of the variants found in different versions suggests that these may bee the result of the blending of several sets of beliefs. Chatham Islands, 11 which were colonized from New Zealand before the coming of the historic immigration. Unhappily, the actual cosmogonic myths recorded from the Moriori are very brief, but, so far as they go they make little mention of the evolutionary theme, ascribing the beginning of all things to Rangi and Papa, of whose origin almost nothing is said. 12 We may, perhaps, regard this as a survival of the older New Zealand belief, which would thus seem to have lacked the evolutionary element, and we should thus be led tentatively to assume that this latter and more philosophic feature represents a later development. Club from the Marquesas Islands. The decoration of heads and faces in various combinations is unquestionably symbolic, but the precise meaning of the various figures is unknown. Peabody Museum, Cambridge, Massachusetts. system: in New Zealand the briefer developmental series led only to the personified Sky Father; here it is the origin of all substance and of solid matter itself which is sought. "He existed. Taaroa was his name. Taaroa is the root, the rocks (foundation). Brought hither, pressed together the earth. Stretch out the seven heavens, let ignorance cease. Create the heavens, let darkness cease. Let the period of messengers cease. In the depths is finished the land of Hawaii." A second version 19 is interesting in comparison with this. "Taaroa (whose origin is not described) embraced a rock, the imagined foundation of all things, which afterward brought forth the earth and sea. . . . Soon after this, the heralds of day, the dark and light blue sky, appeared before Taaroa, and solicited a soul for his offspring--the then inanimate universe. The foundation of all replied, 'It is done,' and directed his son, the Sky-producer, to accomplish his will. In obedience to the mandate of Taaroa, his son looked up into the heavens, and the heavens received the power of bringing forth new skies, and clouds, sun, moon, and stars, thunder and lightning, rain and wind. He then looked downwards, and the unformed mass received the power to bring forth earth, mountains, rocks, trees, herbs, and flowers, beasts, birds, and insects, fountains, rivers, and fish. Rai-tubu, or Sky-producer, then looked to the abyss, and imparted to it the power to bring forth the purple water., rocks and corals, and all the inhabitants of the ocean." "Io dwelt within the breathing-space of immensity. Heaven, be formed' Then the sky became suspended. And at once the moving earth lay stretched abroad." of several deities. The universe, of whose beginning nothing is said, is pictured as a hollow shell, in form like a beet, at the lower extremity of which is "The Root of All Existence," above which comes "Breathing All Life" and the "Long-Lived." Next above, where the walls of the shell come together, is Vari-ma-te-takere ("The Very Beginning"), a female deity who creates six other deities--Vatea (called Atea in the Marquesas, and Wakea in Hawaii), Tinirau ("Innumerable "), Tango (" Support "), Tu-mute-anaoa (" Echo "), Raka ("Trouble"), and Tu-metua ("Stick by the Parent"). Vatea, whose abode was "The Thin Land," espoused Papa (" Foundation" or "Earth"), the daughter of Tima-te-kore ("Nothing More"), and became the parent of the five great deities, Tangaroa, Rongo, Tonga-iti, Tangiia, and Tane. The account does not harmonize well with any of the preceding beliefs, almost its only point of contact being the union of Vatea (associated with the light or bright sky) and Papa, and their consequent begetting of the gods. It seems very probable that the real cosmogonic myths of this group have not been recorded. definitely. 22 Here, however, this type appears itself to be strongly modified in some versions by still another class of myth, that, namely, in which Tangaroa plays the part of a real creator. In the Society Group this feature is still more pronounced, and we have Tangaroa treated almost as a world soul, a deity of whom the cosmos is only a manifestation. One of the most curious and interesting of Polynesian cosmogonic myths is that found in Hawaii, which, although differing in several important particulars from those just outlined, must yet be considered as belonging to the same general type. 23 In the very beginning, however, a striking variation occurs, in that although we have the source of all things from chaos, it is a chaos which is simply the wreck and ruin of an earlier world. "And so, creation begins in the origin of a new world from the shadowy reflex of one that is past. . . .
of day appears. The sea brings forth its higher forms, such as the medusae, fishes, and whales; and in the dim twilight monstrous forms creep in the mud. Food plants come into existence while all nature is thrown into an uproar under the stress of its birth-pains. The fifth period sees the emergence of swine (the highest mammal known to the Hawaiian), and night becomes separated from day. In the sixth, mice appear on land, and porpoises in the sea; the seventh period witnesses the development of various abstract psychic qualities, later to be embodied in man; while in the eighth, the turmoil and uproar having subsided, from peace and quiet, fructified by the light, which is now brilliant, woman is born, and also man, together with some of the higher gods. itself shows indications of a complex origin; so that in Hawaii, as elsewhere in Polynesia, there is evidence that the beliefs of the people in regard to origins are far from presenting a uniform type. In these forms we see very clearly the genealogical impulse and the developmental idea, but here the primeval pair is the solid rock rather than the formless chaos and silence of Marquesan and New Zealand myths. Another version 31 recalls more strongly the Hawaiian type, since it presents a succession of forms of vegetable life following each other as offspring and parent, although the elaborateness and coherence of the Hawaiian evolution of life forms is far from being equalled. In the few fragments of the Tongan mythology which have been preserved 32 no trace of this evolutionary theme appears. 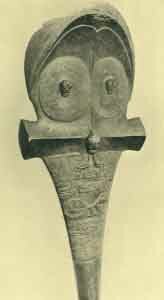 Figure of Taria-nui, "Big Ears," a fishing god, venerate by fishermen and prayed to for success. Rarotonga, Cook Group. Peabody Museum, Cambridge Massachusetts. one or two cases. 35 The important feature is the belief in a pre-existing world of the gods above, whence something from which the world is ultimately to be made is cast down into the universal sea below; and a further element is the appearance of the bird, who is the messenger or offspring of the sky-deity. A similar version is (or was) current in Tonga. 36 Tama-pouli-alamafoa ("King of Heaven"), Tangaloa-eiki ("Celestial Chief "), Tangaloa-tufuga (" Celestial Artisan "), and Tangaloa-atu-logo-logo ("Celestial Messenger") dwelt in the heavens. Tangaloa, the divine messenger, was ordered to descend to this world to see if he could find any land, wherefore he departed on a bird, and after flying about for a long time descried a sandbank on which the waves broke. Returning to the skies, he reported that he could find no dry land, but the lords of heaven said to him, "Wait for seven days, and then go back and look again." He did so and found the land already risen above the waters. Bringing back tidings of his discovery, he was again instructed to wait and to look once more, for this dry land which he had seen was indeed the earth. Tangaloa, the divine messenger, then complained that there was no place below where he could rest and was told to ask Tangaloa, the divine artificer, to cast down chips and shavings from his work. This he did, and the island of Eua arose. The divine messenger again descended and lo, there was land which thus had fallen from the skies. The lords of heaven now ordered him to go and live upon this land, but when he had visited it he returned again to heaven and said, "It is a great land that I have seen, but there is in it no plant or tree." Then the divine chief gave him a seed, ordering him to plant it, and when he had done so, the seed germinated and grew, and a great vine arose, spreading until it covered all the land. of importance regarding the period of Polynesian migrations, since, if this similarity be regarded as too great to be explained otherwise than by actual transmission, we should have evidence that the last wave of Polynesian immigrants must have left the Indonesian area at least as late as the first or second century A. D., by which time Indian civilization had become established in Java. Such a migration, coming into central Polynesia, might have brought this, together with other elements, which later were distributed north to Hawaii and south to New Zealand before the period of wide contact came to an end in the twelfth or thirteenth centuries. The simple statement that the heavens and the earth, sun, moon, plants, and animals were all made or created by some deity is found in one form or other in every Polynesian group, 47 and while such a declaration is not so significant as the more detailed forms, yet it serves to indicate a distinctly different conception from what has been called the "evolutionary" theme. From the materials at present available it would appear that we may with reasonable certainty draw the conclusion that the cosmogonic myths of the Polynesian people are based on at least two themes, one of which may be called the evolutionary or genealogical, and the other the creative. The relative importance and geographic distribution of these two contrasted themes have, moreover, been shown to differ in that the former seems best developed in New Zealand and Hawaii and is largely modified or overlaid by the second in central and western Polynesia. This latter, although it is found almost everywhere in its simple contrast of creation as opposed to evolution, presents an altogether special form in Samoa, and perhaps also in the Marquesas and Society Groups. The evolutionary or genealogical element in Polynesian legends has always attracted attention, and to a certain extent the inborn interest in genealogy shown by all Polynesians is probably responsible for the growth of this side of the mythology. [paragraph continues] Everywhere chiefs, as well as common people, preserved lists of their ancestors extending back for many generations, and in the case of the chiefs a divine descent was claimed. To a people so infused with this genealogical habit the ascription of an ancestry not only to the gods, but to the world and to all natural phenomena, was not an illogical step. Other factors, however, also entered into the problem, for from the character of most of these primitive ancestral pairs it is clear that the Polynesian mind had something of a philosophic turn, and that it groped about for a real cause or beginning, seeking to derive the concrete and tangible from the abstract and intangible. It has been most ingeniously suggested 48 that the peculiar environment of the Polynesians had much to do with the development of their special type of cosmogony. Living, as they did, isolated on small islands in the midst of a wide-reaching expanse of ocean--with the contrast between the immobility and changelessness of their little lands and the ever-moving, ever-changing sea always before them--it would not be surprising if they were led to try to account for this stability in the midst of universal flux on some such basis as that which we actually find. On that theory it is evident that this type of cosmogonic myth would be said to be a strictly local product of the environment in which the Polynesians dwelt; but, on the other hand, there is not a little evidence that the germs, at least, of this type were present among the original immigrants. Theoretically, a quite different solution of the problem might be proposed, based on real or fancied resemblance to Hindu speculation. On this basis it might be argued, as previously in regard to the cosmic egg, that the last immigrant groups to reach Polynesia from the West did not leave the Indonesian region until after this had been influenced by Indian culture, already strong in south-eastern Asia at the beginning of our era; and although this theory meets with several serious difficulties, it must, nevertheless, be taken into consideration. Further discussion of the question of possible Indian influence in Polynesia may, however, best be reserved for the final estimate of Oceanic mythology as a whole. Critical consideration and comparison of the creation theme must also be left until the Indonesian myths have been discussed, for this type, especially in the particular form in which it appears in Samoa and Tonga, is widely distributed in the more westerly area--a region in which, moreover, the proximate origin of the Polynesian peoples must be sought. The myths thus far considered have been those which were concerned only with the source of the world; we have now to deal with those which describe the origin of man. As before, we may recognize more than one type of myth. There is, first, the form according to which the ancestors of mankind were directly created by one or other of the deities. A second type is that where the first human being, a woman, was thus immediately created by a deity and subsequently taken to wife by him, so that man, as his descendant, is thus in origin half divine. Related to this is a third form, where man is said to be the direct offspring of the deities, and so wholly divine. Lastly, we have the types in which human beings are thought to be the result of a sort of evolutionary process, developing from worms, which are shaped and moulded into human form. In Hawaii we also find the myth of the direct creation of man. Here it was said 52 that the three great gods, Kane, Ku, and Lono, formed man of red earth and the spittle of the gods, shaping him in the likeness of Kane; and having made the image, they breathed into it, calling on it to rise, and it became alive. The ensuing episode of the creation of the first woman from one of the man's ribs is clearly the result of missionary contact. A similar tale is given from Tahiti, 53 where, however, Taaroa is the creative deity. him, 'Go to your ancestor Pakoti.' Tane did as he was bid, but Pakoti only brought forth harekeke (= Phormium tenax). Tane had a great many other wives at his mother's bidding, but none of them pleased him, and his heart was greatly troubled, because no child was born to give birth to Man; so he thus addressed his mother--'Old lady, there will never be any progeny for me.' Thereupon Papa said, 'Go to your ancestor, Ocean, who is grumbling there in the distance. When you reach the beach at Kura-waka, gather up the earth in the form of man.' So Tane went and scraped up the earth at Kura-waka. He gathered up the earth, the body was formed, and then the head, and the arms; then he joined on the legs, and patted down the surface of the belly, so as to give the form of man; and when he had done this, he returned to his mother, and said, 'The whole body of the man is finished.' . . . Then he named this female form Hine-ahu-one (= the earth formed maid)." Tane took Hine-ahu-one to wife. She first gave birth to Tiki-tohua--the egg of a bird from which have sprung all the birds of the air. After that, Tiki-kapakapa was born--a female. Then first was born for Tane a human child. story seems also to have been current in the Marquesas, 58 where again it is Tiki who thus creates a wife for himself from the sands of the shore. A belief in the direct descent of man from the gods seems not to be so clearly or explicitly stated in the Maori myths, although references to this type do occur. 59 In the Cook Group, 60 three sons of Rongo are said to be the ancestors of all the peoples of Mangaia, though we are not told of the divine origin of their wives. The Marquesans 61 appear also to have had a similar belief, since mankind was derived from Tii-tapu (the son of Tii, who was a descendant of Atea and Atanua) and Hina-ua. 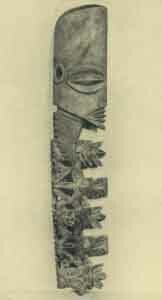 Carved end of a long staff, once wrapped in a great roll of tapa, or bark-cloth, and representing one of the great gods of Rarotonga, Cook Group. It is probable that the deity is Rongo and his three sons. Peabody Museum, Cambridge, Massachusetts. land, where he assumed the appearance and substance which should constitute man. Hina, returning from her unsuccessful search . . . met him, but not knowing him said, 'Who are you?' 'I am Tii-maaraatai,' he replied. 'Where have you been?' said the goddess. 'I have sought you here, and you were not; I went to the sea to look for Tii-maaraatai, and he was not.' 'I have been here in my house, . . . 'answered Tii-maaraatai, 'and, behold you have arrived, my sister, come to me.' Hina said, 'So it is you who are my brother; let us live together.' They became man and wife, and the son that Hina afterward bore they called Tii. He was the first-born of mankind." A comparison of these various myths of the origin of mankind shows the presence of no little confusion. Tiki or Tii is at once the first man, and the creator or progenitor of man; other myths do not speak of the first woman made by Tane as human, but as a deity, whose descendant, Hine-nui-a-te-po, becomes the guardian and goddess of the underworld; and many or most of the characters in the myths are nothing more than thinly disguised personifications of natural phenomena. All this obviously implies a confusion of the human and the divine--theories of actual creation, influenced by the deep-seated desire to trace ancestry back to a divine source. A transition to the last type of myths explaining the origin of the human race is afforded, in some senses, by a legend from New Zealand which apparently ascribes an independent origin to man. According to this, 67 "an aquatic plant growing in swamps was the male procreating power which engendered the red clay seen in landslips, whence came the first man. This man was discovered by one of the gods before light had dawned on this world." "Seeking, earnestly seeking in the gloom. On the bounds of light of day. And the cup of life. The faintest gleam of light. Inasmuch as the "man" thus discovered was the grandfather of him who separated heaven and earth, it is obvious that here again we have a confusion of terms, and that this man was not regarded as an ordinary human being in any sense, for his exploits are those of gods--exploits, indeed, expressly attributed to Tane and other deities in variant myths. the heavens alone were inhabited, and the earth covered over with water. Tangaloa, the great Polynesian Jupiter, then sent down his daughter in the form of a bird called the turi (a snipe), to search for a resting-place. After flying about for a long time, she found a rock partially above the surface of the water. . . . Turi went up and told her father that she had found but one spot on which she could rest. Tangaloa sent her down again to visit the place. She went to and fro repeatedly, and every time she went up reported that the dry surface was extending on all sides. He then sent her down with some earth and a creeping plant, as all was barren rock. She continued to visit the earth and return to the skies. Next visit, the plant was spreading. Next time, it was withered and decomposing. Next visit, it swarmed with worms. And the next time, the worms had become men and women!" 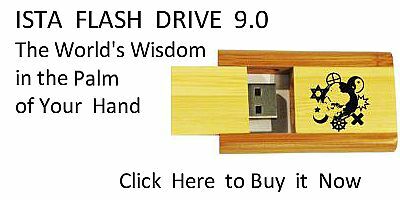 It should be noted that, according to one of these versions, when man was first made or evolved from the worms, he was "formless," the meaning apparently being that he did not yet have human shape. Outside of Samoa this myth does not occur in just this form, but in Tonga we find a tale 70 describing the origin of man from worms scratched out of the sand by the sandpiper and left to rot in the sun. It was this bird which was the daughter of Taaroa in the Samoan myths, and which, in one version, brought to Taaroa the worms developed from the rotting vines that he might make them into man. Elsewhere in Polynesia we find little trace of this story, unless the fact that in the Society Group 71 the first men were said to have been originally like a ball, their legs and arms being afterward pulled out, may be taken as comparable to the Samoan idea of an originally formless being. 72 We shall see later that this conception of an amorphous being, afterward becoming human in shape, was also characteristic in parts of Indonesia and Australia. but whose affiliations run in quite a different direction. In the Chatham Islands (whose population, it will be remembered, represents largely a pre-Maori people) a myth has been recorded 73 which states that man originated miraculously from a clot of blood placed by two deities in a hollow tree. Elsewhere in Polynesia mankind is not ascribed to such a provenance, but in Samoa 74 it is given in several myths as the mode of origin of minor deities. It is, however, a wide-spread myth of the source of mankind or of individual human beings in various parts of Melanesia 75 and would thus seem to suggest an early Melanesian element in western Polynesia and the Chatham Islands. An origin-myth of a still different sort is that found in the little island of Nieue, which lies between Tonga and the Cook Group, according to which the first man was born from a tree; 76 and perhaps a trace of this same idea may be seen in the New Zealand myth 77 of Tane marrying a tree which gave birth to living beings and minor deities. In discussing the legends relating to the origin of the world it has already been pointed out that analysis reveals complexity, and that comparison suggests relationship beyond the limits of Polynesia. It is equally clear that in the accounts given of the origin of man there is an equally complex series with similar suggestions of affiliation far afield. This diversity in type within the Polynesian area, and the wide ramification of similarities in the areas lying farther west, will, as we proceed, be found to be no less characteristic of almost all portions of Polynesian mythology. him, so he came down to Papa. At that time "absolute and complete darkness prevailed; there was no sun, no moon, no stars, no clouds, no light, no mist--no ripples stirred the surface of ocean; no breath of air, a complete and absolute stillness." 78 And Rangi set plants and trees to cover the nakedness of Papa, for her body was bare, placing insects of all kinds appropriate to the various sorts of vegetation, and giving their stations to the shellfish and the crabs and various sorts of living things. Then Rangi clave unto Papa, the Earth Mother, and held her close in his embrace, and as he lay thus prone upon Papa, all his offspring of gods which were born to him, both great and small, 79 were prisoned beneath his mighty form and lived cramped and herded together in darkness. "Because Rangi-nui over-laid and completely covered Papa-tua-nuku, the growth of all things could not mature, nor could anything bear fruit; . . . they were in an unstable condition, floating about the Ao-pouri [the world of darkness], and this was their appearance: some were crawling, . . . some were upright with arms held up, . . . some lying on their sides, . . . some on their backs, some were stooping, some with their heads bent down, some with legs drawn up . . . . some kneeling. . . . some feeling about in the dark . . . . they were all within the embrace of Rangi and Papa." 80 So for a long time the gods dwelt in darkness, but at last the desire came to them to better their condition, and for this purpose they planned to lift Rangi on high. The version of this myth of the raising of the sky, given by Sir George Grey, 81 is one of the classics of Polynesian mythology, and deserves to be quoted almost in full. "The brothers all consented to this proposal, with the exception of Tawhiri-ma-tea, the father of winds and storms, and he, fearing that his kingdom was about to be overthrown, grieved greatly at the thought of his parents being torn apart. Five of the brothers willingly consented to the separation of their parents, but one of them would not agree to it. . . .
limbs with mighty effort. Now are rent apart Rangi and Papa, and with cries and groans of wo they shriek aloud, 'Wherefore slay you thus your parents? Why commit you so dreadful a crime as to slay us, as to rend your parents apart?' But Tane-mahuta pauses not, he regards not their shrieks and cries; far, far beneath him he presses down the earth; far, far above him, he thrusts up the sky. . . .
Up to this time, the vast Heaven has still ever remained separated from his spouse the Earth. Yet their mutual love still continues--the soft warm sighs of her loving bosom still ever rise up to him, ascending from the woody mountains and valleys, and men call these mists; and the vast Heaven, as he mourns through the long nights his separation from his beloved, drops frequent tears upon her bosom, and men seeing these, term them dewdrops." 'Carry Raki on the back. Now, Raki was raised with the aid of this prayer, and spoke words of poroporoaki (farewell) to Papa, and said, 'O Papa! O! you remain here. This will be the (token) of my love to you; in the eighth month I will weep for you.' Hence the origin of the dew, this; being the tears of Raki weeping for Papa. Raki again said to Papa, 'O old woman! live where you are. In winter I will sigh for you.' This is the origin of ice. Then Papa spoke words of farewell to Raki, and said, 'O old man! go, O Raki! and in summer I also will lament for you.' Hence the origin of mist, or the love of Papa for Raki. The Heavens were fast, but are lifted. very low, and that one of the deities raised it to its present position. Now this form of the myth appears in the New Hebrides, 91 where the heaven was said originally to have been so low that a woman struck it with her pestle as she was pounding food, whereupon she angrily told the sky to rise higher, and it did so. Almost identically the same type appears in the Philippines, 92 and the simple theme of raising the heavens, which once were low, is frequent in several other parts of Indonesia 93 as well as in the intervening area of Micronesia. 94 It would seem, therefore, that the Maori form of the myth represents a special or locally developed form of this widespread theme, which reaches back almost without a break from central Polynesia to Indonesia. In the foregoing legends of the raising of the sky this is accomplished by one or other of the gods, and it is clearly a cosmogonic feature, especially well brought out in New Zealand, as will be shown presently when the myths of the origin of the sun, moon, and stars are considered. The episode, however, appears in parts of Polynesia in quite another aspect, i. e. as one of the exploits of the hero Maui, 95 but since the Maui cycle will be treated in a special chapter, discussion of the place of this episode in it may best be postponed for the present. Nevertheless, it should here be noted that whereas in Hawaii the theme occurs only in connexion with Maui, in New Zealand it is known solely as a cosmogonic myth, while both forms are found in central Polynesia. 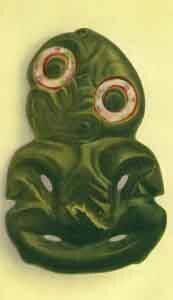 Nephrite ornament and amulet, known as Hei-tiki. It is supposed to represent a human foetus and is worn to preserve the wearer against attacks of the spirits of still-born children, who are supposed to be especially malicious because they regard themselves as cheated out of the chance of life. Maori of New Zealand. Peabody Museum, Salem, Massachusetts. Samoan myth fragment relating to the origin of the sea is of interest as evidencing the Melanesian influence to be found on this western margin of Polynesia. According to this tale, the sea was originally concealed and kept shut up, but was later let out, the result being a flood. 109 More detailed versions of this incident are wide-spread in Melanesia, 110 whence this Samoan fragment was probably derived. The evolutionary growth and origin of plants and trees in Hawaiian mythology has already been outlined, and Rangi's setting of plants and trees upon Papa in the Maori myth has also been noted, 111 but some versions include a curious incident. According to these forms of the myth, 112 Tane planted trees upon his mother, Earth, after the raising of Rangi. At first he set them with their heads (i. e. their roots) up and their feet down, but since he did not like their appearance he reversed them, and placed them with their heads in the earth and their feet up. With this he was much pleased, and so they grow to this day. The unusual idea of trees having formerly been upside down may perhaps be connected with the frequent Indonesian 113 and Micronesian 114 theme of the great tree hanging upside down in the sky, by whose branches men passed back and forth to the upper world. mountain. Of a similar type are the references in Hawaiian mythology to the "Sea of Kahinalii." According to this tale, 119 Pele, the fire-goddess, once lived far to the south-west, but when her husband deserted her, she set out to try to find him. To aid her in the search, her parents gave her the sea to go with her and bear her canoes, and as she journeyed she poured forth the sea from her head, the waters rising until only the tops of the highest mountains were visible, but later retiring to their present level. A somewhat more elaborate flood-myth is reported from Raiatea in the Society Group. 120 According to this version, a fisherman once got his hook entangled in the hair of Rua-haku, a sea-god, who war, asleep at the bottom of the sea, but when the man tried to pull in what he fancied to be a great fish, he so enraged the deity that he was about to destroy his disturber. The fisherman, however, begged for mercy, and the god finally agreed to spare him, but insisted on revenging himself upon the rest of the world. By Rua-haku's advice, the fisherman took refuge on an islet with a friend, a hog, a dog, and a couple of hens, and the sea then began to rise, continuing so to do until all the world was overflowed, and all the people had perished, after which the waters retired to their former level. of a somewhat different type in that they are more a part of the cosmogonic tales. According to one version, 123 in early times there was a flood which destroyed all beings, except one man, Pili, and his wife, who took refuge on a rock, these survivors subsequently becoming the ancestors of mankind. Another form of the myth 124 states that when the flood came, Seve and a man called Pouniu alone saved themselves by swimming. Tangaloa saw them from the sky, and pitying their plight sent down two men from the heavens with hooks, who drew Samoa from under the sea to serve as a refuge for the two who were thus rescued. Although there may be some question whether the end of the Raiatea story shows traces of missionary influence, all these flood-tales are probably aboriginal. As much cannot be said, however, for the versions from New Zealand, 125 the Marquesas, 126 and Hawaii, 127 in all of which the Biblical parallel, extending even to names and details, is far too close to permit us to regard the tales as other than local adaptations of missionary teaching.